Are you aware of as to what goes behind the scenes.. I mean what users do in your WordPress website backend? Have you thought about your website security seriously? If not, you must start using the WP Security Audit Log plugin. But before digging deeper into WP Security Audit Log, let’s understand why security is so important. Why security is your topmost priority? Let’s say you have asked your own developer to tweak some code; or your blogger to edit a post. You may even have hired a person from outside to do the job. Now, how will you track these? Is the developer committed to the job (starts and completes on time)? Has the blogger edited the post more than he should? Has the hired person hacked into your website pages when he shouldn’t? Is it worth spending the price considering the time taken by the individual person? and many more cases needs to be tracked…maybe beyond hundred. Not tracking user activity poses a serious threat for your website. You may never know whether the user breached your security at any point of time. And you may not be able to judge accurately how productive each user turns out. That’s the reason why monitoring every single user activity is of utmost importance and that’s why the WP Security Audit Log WordPress plugin is a must. 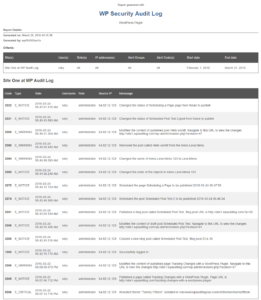 The WP Security Audit Log plugin is the most comprehensive audit log plugin. Being around for almost five years and 60,000+ active installs, it’s a popular choice amongst WordPress users. It keeps an audit log of everything that happens on your WordPress website as well as WordPress multisites. Be it yourself, your developers, bloggers, temporary users or outsourced personnel , WP Security Audit Log plugin keeps a complete watch on the user activity and records the changes in a WordPress audit trail, that is available on your WordPress backend. Blog post title change, password change, change of user role, what time the user performed a task, etc.. all gets recorded. The plugin is free to use. Though, there is a premium edition available to enhance the functionality of the plugin. An audit trail, also commonly known as a WordPress audit log, is a security-relevant log in which a chronological record of a sequence of changes and activities are recorded. Someone has overwritten someone else’s change or someone changed the content of the main page; someone else changed the main menu or its location. When you try to find out what exactly happened no one takes responsibility. Thus, having a audit trail lets you know exactly which user performed which task at what time. Keeping a record of all the changes that took place in WordPress audit trail will make troubleshooting very easy. You can use the WordPress audit trail to go back through the changes and identify those that might have led to the existing problem. Numerous failed login attempts and several requests that generate 404 errors are all signs of a WordPress website attack. Recording such activities will alert you via email (need to configure it) and you can easily thwart the attack before its occurence. All WordPress websites used for online business have to be compliant to several legal and regulatory compliance requirements, such as PCI DSS. One thing that all of these requirements have in common is the requirement to keep an audit trail of everything that is happening on your WordPress website. Pages, custom post types, comments, plugins…be it any category, WP Security Audit Log plugin provides alerts for each of these and it’s severity – warning , notice or high. If you own a multi user WordPress blog or website, or a WordPress multisite network installation you can use WP Security Audit Log plugin to monitor your users’ activity and productivity. 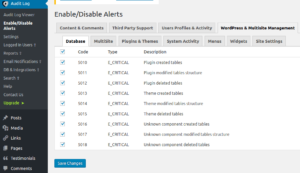 You can view complete list of all changes the WP Security plugin keeps a record of in the complete list of WordPress security alerts. How to secure websites from temporary users? Marketers to design offers, make coupons.. But for security reasons, you want to delete their account once the job is done. Right? And what’s the easy and faster way to do that? It’s the Temporary Login Without Password plugin from StoreApps. 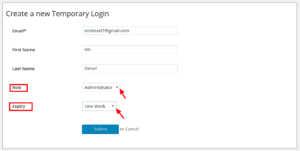 Using the Temporary Login Without Password plugin, you can create self-expiry login links for these users without the need of a password. A special link will be created using which these users can login to your WordPress site without needing a username and password. You can choose when the login expires, as well as the user role of the temporary account. Temporary users links expire as you wish but what about security when they are using the backend area? Then, WP Audit Security Log is a great solution in such cases. Using WP Security Audit Log with Temporary Login Without Password is the best way to secure your website from temporary users. You can easily keep a track on what temporary users are doing on your website in real-time. 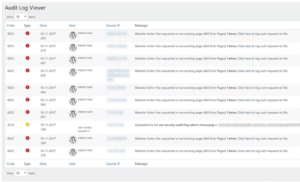 Whatever alerts WP Security Audit Log records for users, the same can be recorded for temporary users as well – title change, time spent, webpages browsing, comments, etc. Tracking of each user activity on WordPress website during their account activation period. Both these plugins are free to download and use. Installing WP Security Audit Log is very simple. Download the plugin from the WordPress repository. Install and activate. 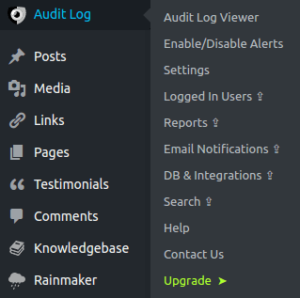 The plugin adds its own menu called “Audit Log” just below the WP Dashboard and starts keeping a log of every change automatically. The Audit Log Viewer is the first option in the menu. Every enabled and triggered alert can be viewed here. You can even sort the alerts list based upon all of the displayed criteria including code, date, username and source IP. This forms the core part of the plugin. It lets you choose which user activities you want to track. There are over 100 activities to choose from, broken down into various categories for easier navigation. All alerts are enabled by default. You’ll be able to enable or disable each alert depending on your specific needs. Each alert has its own specific code, type (notice, warning and critical) and description. The settings tab is divided into three sections – General, Audit Log and Exclude Objects. Under General, you can set from name and email details. 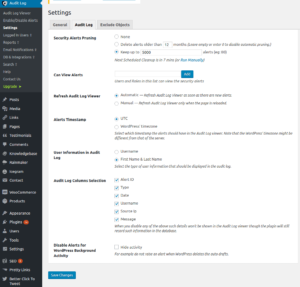 Next up is an option to add the most recent 5 alerts to your WordPress Dashboard and some Proxy / Firewall options that will adjust how the WP Security Audit Log plugin retrieves a users IP address when running behind a web application firewall. 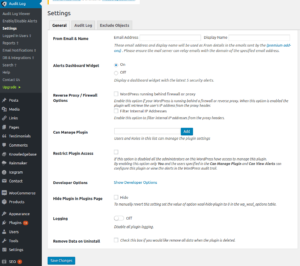 By default only WordPress administrators can view the alerts or manage the plugin but this can be changed and access can be granted to specific roles and users by simply adding the information in the ‘Can Manage Plugin’ settings. Under Audit Log, you have option to manage your alert database – how much to retain. What follows next is to control how the Audit Log is displayed – automatic or manual refresh, displaying specific columns and the time format. The exclude tab allows you exclude specific users and roles from monitoring as well as any activity from a specific IP address and custom fields changes. 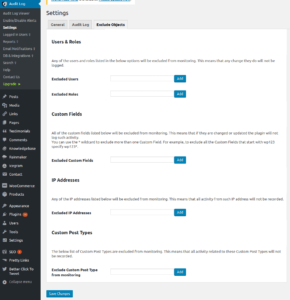 Logging into WordPress every time to check alerts is troublesome. 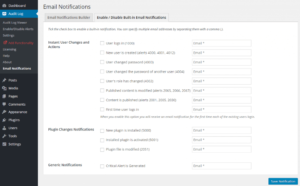 Hence, this feature allows you to get notified via email when important changes happen on your WordPress website. All you need is to setup and trigger some alerts. Using the reporting module, you can create customized WordPress log reports, either in CSV or HTML format. The benefit is it does not restrict you to what type of data you can include in your WordPress reports. You can also configure automated reports which you can receive via email on a daily, weekly, monthly or quarterly basis. This tool allows you to see who is logged in to your WordPress website, remotely terminate sessions and block multiples sessions for the same user. You will automatically notified via email when multiple sessions of the same user are allowed or blocked. Manually browsing through thousands of alerts is a huge pain. Thus, the ‘Search’ functionality allows you to search for a particular alert. It has both free-text based search and filters to make your job easier. 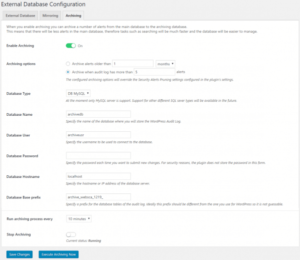 This database and integrations tool enables you to save the WordPress audit trail to an external database (rather than in the WordPress database). This keeps your main database small, manageable and fast. The WP Security Audit Log is a great plugin for all WordPress users as well as multisite users. In terms of security, you can monitor what happens in your site’s backend area in real-time. At many occasions, these plugin acts as a wall to users who tries to breach security. Not just that, using Temporary Login Without Password along with WP Security Audit Log is a great combo solution you would ever come across to keep a watch on all your WordPress users. Give it a try and let us know about it in the comments section. Happy to see one of my favourite security plugin get some love here. I implore anyone using it to upgrade to PRO as it’s email notifications, Search and reports are of immense value.